Azerbaijani official: Lifting Section 907 would boost ties with U.S. Cancellation of Section 907 which is still in force would give an impetus to the development of relations between Azerbaijan and the U.S, Azerbaijani Finance Minister Samir Sharifov said at an event dedicated to the United States Independence Day, July 4. Section 907 of the United States Freedom Support Act bans any direct US aid to the Azerbaijani government. Congratulating the people of the U.S. on behalf of the Azerbaijani government, Sharifov said that Azerbaijan has established diplomatic relations with the U.S. since regaining independence and pays special attention to its relations with Washington. Sharifov went on to say that Azerbaijani National Leader Heydar Aliyev attached special importance to the US-Azerbaijani relations and today Azerbaijani President Ilham Aliyev, pursuing a successful foreign policy, also attaches great significance to bilateral relations, including the strengthening of cooperation in the spheres of security and energy. Sharifov said that 73 documents have been signed between Azerbaijan and the U.S. and an effective legal framework has been created for the relations between the two countries. Sharifov also said that as a co-chair of the OSCE Minsk Group the U.S. plays an important role in the resolution of the Armenia-Azerbaijan Nagorno-Karabakh conflict. 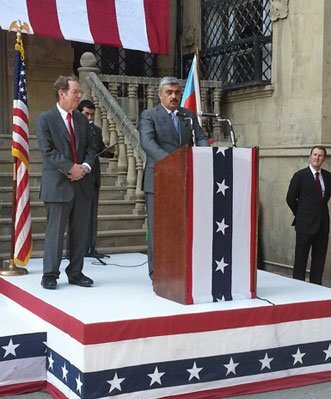 The U.S. Embassy in Baku held an event dedicated to the celebration of the U.S. Independence Day on July 3. The event was attended by Azerbaijani officials, MPs, representatives of the public, ambassadors of foreign countries based in Azerbaijan, etc. Speaking at the event, US Ambassador to Azerbaijan Richard Morningstar said that today the U.S. celebrates the 237th anniversary of the establishment of an independent state and briefed the attendees on U.S. history. The ambassador touched upon U.S.-Azerbaijan relations and also said Azerbaijan has made significant improvements since its independence. "Azerbaijan has actually asserted itself as a truly independent state playing a significant role on the regional and global stage. Who could imagine 25 years ago that Azerbaijan would become a non-permanent member of the UN Security Council, Azerbaijani and US soldiers would serve shoulder to shoulder in Afghanistan and Azerbaijan would provide the energy security of Europe?" Morningstar said. Azerbaijan and the U.S. have common values and interests. Both nations are at the forefront of driving regional security, economic and energy development, diversity and inclusiveness. Under President Ilham Aliyev's leadership, Azerbaijan has emerged as America's reliable regional partner at the world's uniquely critical crossroads. Azerbaijani servicemen serve shoulder-to-shoulder with American soldiers in Afghanistan. Azerbaijan enjoys strong relations with Capitol Hill. The Congressional Azerbaijan Caucus has played an important role in fostering the growing partnership between the U.S. and Azerbaijan and advancing US interests in the pivotal Caspian region. In recent years, Azerbaijan has intensified its outreach at the state and local levels. Currently, in addition to the Embassy in Washington, Azerbaijan runs a Consulate General in Los Angeles and an Honorary Consulate in Santa Fe.